It is time that I turn a corner. After much reflection I must accept that what I thought of as my “self“ does not exist. It’s been coming for a while but here it is. I am not me. Technically, the inexistence of the self is easy to grasp. Our brain is a marvellous organ with the peculiar property that it can process information by approximation and it has the natural ability to forget. Our brain can also think, i.e. entertain an internal dialogue between, ehh, ourselves. Well, two words really, “our selves”. Who these selves are is really not clear. Depending on our internal dialogues, these selves take all sorts of identities. Sometimes they are conscientious, at other times they are cruel. They may be lethargic or energetic. Introspection into the nature of our selves will only produce a long list of individuals that we appear to be. Is it a wonder we get confused about our true nature? What is really curious is that our brain has awareness. We ‘know’ that we think. We can listen to our selves thinking. This is a surprising feature and also very hard to comprehend. How can we be aware of our thinking? Or more generally, how can we be aware that we even exist. This is what consciousness really is; to know that we exist. Although René Descartes’ “I think, therefore I am” only approximately conveys his profound realisation, it was pivotal in his appreciation of our consciousness. He then went on to associate that consciousness with God and in a masterstroke of argument inversion used our awareness of thinking as the ultimate proof of God. Had he lived today, he would have drawn a very different conclusion, I’m sure. This is all very well but like Descartes then, I am sidestepping the question. How can we be aware that we think? And following from that, how can we know that we have a self? With the technological and scientific progress of the last century, we are comfortable with the idea of robots that can interact with their environment. We have conceived them and we have built them. Some are fully autonomous and some are partially controlled by humans. 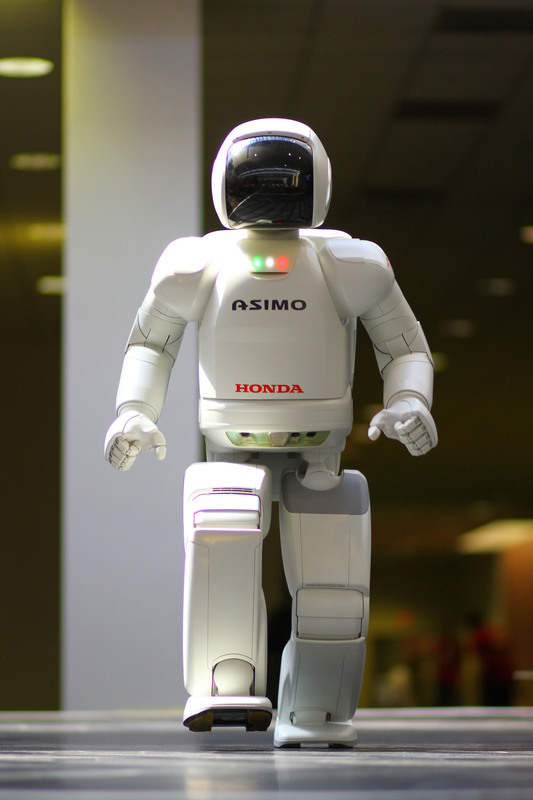 Honda’s Asimo robot is fully autonomous. It can see, hear and feel its surrounding and respond in kind. But it has no consciousness. Why not? Because consciousness is a bad idea. Autonomous robots are aware of their environment and they have powerful brains to be able to interact with that environment. Imagine that this robot looks down and sees its own foot. What will its computer make of that? It will probably label it as: “foot”, “not interesting”. But Chip goes further. He allows the robot to read the outer layer of her own computer brain and express what she sees there. Zyra looks in the mirror again and after, “Hello pretty!”, she reads what the computer brain is calculating. “Pretty robot. Pretty Zyra. Pretty Zyra. Pretty Zyra. Pretty Zyra…”. In being able to read her own computer brain, Zyra will read that which she has just seen. And after that, she will read what she has just read about what she has seen. The words in her computer brain will reflect themselves as mirrors in mirrors. Zyra might even speak the words and then she will hear herself say these same words. More mirrors. It gets worse. Zyra can also read her own computer memory. In doing so, her pattern recognition software will begin to match the images she sees in the mirrors of her computer brain with memorized images. At this point Zyra is no longer interacting with her environment, she is interacting with her memories and the images they present on the surface of her computer brain. Zyra has become aware of her own thinking. Zyra is now technically conscious. Synergy sees a memory of Zyra. Zyra sees a similar memory. “Yes. You spoke about the constellations”. Synergy stands tall, he raises his chin and proclaims. And with this language short form, Synergy and Zyra have become conscious of their selves. These selves simply refer to them as robots and all the memories they have of those robot selves. These selves are the accumulation of awareness of their time as robots. The mad engineer, Chip, wasn’t satisfied and smiled a malicious grin. He was running out of budget and with all this self observation, Synergy’s and Zyra’s memory banks were filling up fast. So he introduced ‘forgetting’. From now on, the robots would forget everything that wasn’t used very often. Synergy and Zyra sat on a beach, staring at the stars. “The universe is huge”, Synergy observed. “And we are so small”, Zyra added. They had forgotten that “I” and “me” were naming conventions. Instead they saw the I’s, me’s and we’s reflecting in the mirrors within the mirrors of their computer brains. The harder they looked, the more complex it got. The infinite reflections of the selves, their own, those of others, became so complex that they had to admit defeat. “We will never know”, Zyra sighed. Self is god by another name. There is just the mind seeing its the memories of its experiences reflected in the mind, a million times. Are you disappointed? Do you feel deflated? Just because self and god are auto induced phenomena doesn’t negate everything else out there. There is a rose. It is pink and its fragrance makes a passing bee ecstatic. Synergy was right, the universe is huge. It is infinitely complex and beautiful. The only takeaway from our inevitable loss of self is that we need to look outwards, not inwards, to discover and experience awesomeness. We should turn our backs to the mirror of consciousness and see. For the first time perhaps. One day, we will build a conscious robot with a self and that day we will be forced to reconsider our own nature. That day will come soon enough. So, if I’m reading this correctly, you’re saying we were created – just like Synergy! Well, we evolved from random molecules and at some point we developed a sense organ that could observe the surface of our minds. That’s when we became conscious. From that point we developed a false sense of self and to explain that we created a god. Definitely no creator involved in this. Sorry, I couldn’t resist. I had a similar comment thrown at me by a Christian recently. Really enjoyed the post. I did wonder, “Violetwisp looking for a creator???”. Thanks for stopping by! Hi! Decided to drop by for a while. Your post got me thinking about what you said about beauty: haven’t we also forgotten what beauty really is? How does the concept come into being? What triggers it? Hi David, good to see you here! I’m not surprised that your self disappeared a while ago. Beauty… that is a post in itself. In my model of reality, everything has “beauty”, or rather, if we get into an enlightened state of mind, through loss of self or drugs, we can see beauty everywhere. Therefore, whether we see it or not has more to do with us than with the object of beauty. My theory is that reality is infinitely more complex and detailed than our blurred conscious memory allows for and unless we actually block out our blurred memories and just take reality in as it is, then we will have a hard time seeing beauty. In that sense, the self is a hinderance to beauty. Are you in Germany now? Good luck with settling in. Schopenhauer said that if we look at another person’s hand, we see a hand. If we look at our own hand, we have the extra information about its weight and temperature, its location in space, the sensory information from our skin. I think much of our sense of self is derived from that, even if all that takes place in the brain while we perceive it in the body. If it wasn’t connected to our sense of a body, our self (or whatever you might like to call it) might be a lot more fluid. Thanks Pipteinpteron! I agree that our sens of self starts with the physical self and ultimately, it ends with that too. Without the body we would perhaps not have this urge to make ourselves meaningful. Hard to say. In meditation we begin by removing ourselves from the conscious experience of the body before removing ourselves from the conscious experience of self. Although removal of the self is harder than the removal of body, that is in part because the self is a playful slippery eel! I’m not crazy about robots but they served me – as they should 🙂 – in my mind experiment. I’m looking forward to my post on beauty too. It will be a special post, different. Oh wow, this is great! I’m copying it for future reference. I see conscious as a simple feedback mechanism where the brain senses its own activity. I much prefer your example. Well John, your 9 word summary does a pretty good job for me!!! As an engineer I have developed a lot of feedback systems and they all have in common that they go haywire if you give them half a change. Seriously, I question the evolutionary wisdom of conscious awareness. The flowers in my garden have no thoughts but judging by their enthusiastic flowering, they experience bliss every minute of the day. If the skill/curse was a neurological short-circuit then it must have had some serious benefits for survival over non-awareness. Hey, it might have been nothing more complicated than it helped some guy pick up women. As in picking up beyond the need for survival of the specie? Yep, that would be a valid reason. Very true. Now we know what sets man apart from the other creations. Finally, we have the meaning of life and I’m not disappointed. And all the while God is still writing out the digits of pi. Missing out an’ all. Existence is one thing, analysis an endless other. Self-analysis? Now, there’s something we all seem to love! Your thoughts on beauty might steer close to Platonic Forms which is fine by me. It becomes essential, elemental and pure. The ability to see that is the ability to see true beauty indeed. And I want one of those robots. That experience of reality sounds fiendishly slippery. In essence it’s like the only way to experience reality is to totally abandon it. What a head-melter. Good luck to us all!